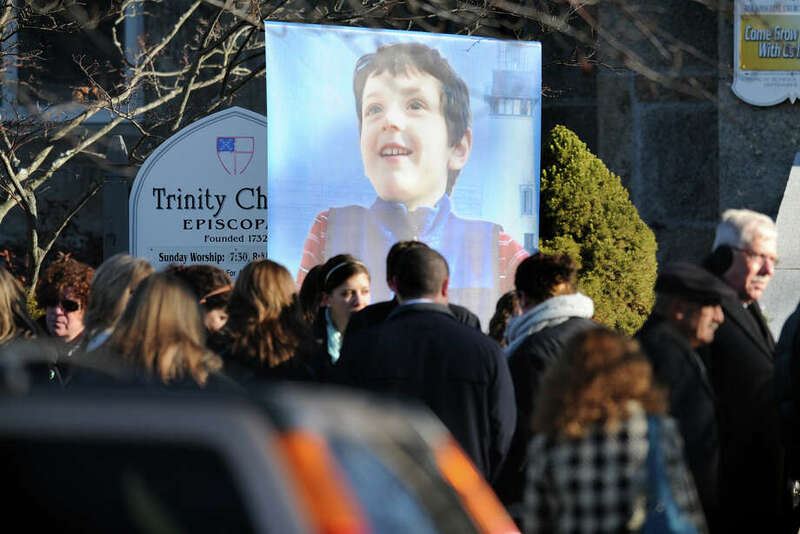 NEWTOWN -- Benjamin Andrew Wheeler was remembered by family and friends Thursday at a packed funeral service here as a rambunctious Tiger Cub Scout who loved the Beatles and lighthouses. Wheeler, 6, was an inspiration to his parents, who thanked members of the community and Trinity Episcopal Church "who cared for him in that `wipe that nose kinda way.' "
Two congregants, Mary Birdsong and Kimberly Ann Evans, sang the Beatles song, "Here Comes the Sun," to tearful eyes and drawn faces in the wooden pews and along the church walls. Wheeler's life was taken in the unfathomable tragedy last week at Sandy Hook Elementary School that stunned the nation. "This has been a time that none of us have lived through before. It is inexplicable in human terms," the Rev. Kathleen Adams-Shepherd told an overflow crowd at the church that included Gov. Dannel P. Malloy. She remembered Wheeler as a boy with inexhaustible energy, and gathered children in the church at the railing before the altar to hand out lighthouse-shaped Christmas ornaments as a remembrance. The reverend told the congregation that Wheeler's life was cut too short by a "sick young man with access to weapons that should never, ever be in a home." Born in New York, Wheeler was growing up in Connecticut where he attended Sandy Hook Elementary School and was active in Scout Den 6. Scout leaders from Connecticut and New York attended the funeral for Wheeler, one of two Scouts killed in the shooting last week. A funeral for Jack Pinto, 6, was held Monday. The Scout leaders, holding banners, stood stoically, lining the front entrance of the church. Those attending the funeral openly wept throughout the service, held in the stone structure erected in 1870. An overflow of people stood on the lawn outside. Across the street was a throng of media and cameras. A large number of relatives were joined by friends of the family as they shared their grief on a day when five memorial services were held for victims of the massacre. "Gracious God, we come before you this day in pain and sorrow," Adams-Shepherd said. "We grieve the loss of Benjamin, a precious human life."